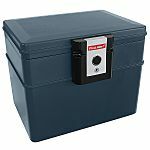 Floor Safes: If you want to hide your safe, this is great opportunity for you to do it. These are usually hidden under ground and secured by concrete, some of them have welded mesh panels integrated within the concrete. Key Lock Safe: This locking method is the most popular. A high security key lock is used to lock and unlock the safe and help keep valuables safe and secure. Some safes feature dual key locks that require both keys to unlock the safe for added security. 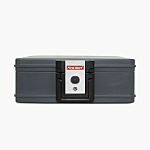 These safes can be wall or floor mounted for extra security and are ideal for storing smaller cash and valuables. Fingerprint Safe: These safes can only be opened when a pre-scanned fingerprint is swiped over the fingerprint reader. A resettable digital keypad and override keys are also incorporated. These safes can be bolted down for extra security. 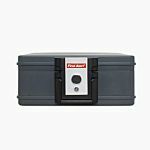 These safes or chests have a fire and water resistant construction and are designed to provide protection to paper documents, media and valuables from fire and flood damage. They have a top and lid and a key-lock locking mechanism.